Try giving him mash, gloop, chop or whatever for breakfast and all day picking and putting some nice budgie mix in his cage at sunset and walking out of the room until it's dark - I bet you he will go into the cage by himself. Maybe not the first day and maybe not the second but it will happen. My Zoey was doing the same thing. She would spend the entire day without any food because she refused to go into her cage and would fly away from me when she would see me walking toward her (she is a smart cookie and knew I wanted to put her in ) but, even though it took a couple of days and a couple of hours of 'work' to convince her to trust me (you can't insist, you have to let them go, wait about ten minutes, try again and fail, wait another ten minutes, try again, etc), she is now fine (she went into her cage all of her own last night and the night before). 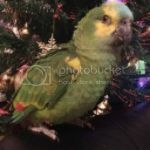 Pajarita wrote: Try giving him mash, gloop, chop or whatever for breakfast and all day picking and putting some nice budgie mix in his cage at sunset and walking out of the room until it's dark - I bet you he will go into the cage by himself. Maybe not the first day and maybe not the second but it will happen. I woke up very late yesterday and forgot to feed the little ones and didn't realise until they start foraging on the floor for food and I got up and fed them pellets and they all went in the cage and I closed it so I will try what you suggested and don't feed them too much during the day. They are good and they all do get attention not that the Cockatiels need it lol they come to me when they want something.Ive also been thinking of trying to find a Female Plum head for Mango so that will be my mission and at this stage there is no hunt for Tiko its been too long and theres no way shes anywhere outside so the best we can do is just hope someone sees her ads and brings her home.